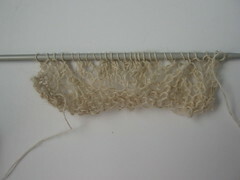 very slowly i’m beginning to learn what makes for decent yarn, and it’s not necessarily what i would have expected. this yarn looked lovely, a smooth even singles, with this one i thought i was finally getting the hang of spinning the alpaca. but in use it turned out to be quite wirey and decidedly _un_lovely. the fact that the needles are too big doesn’t help much. i’ll probably carry on with this, if only to get more practice with the branching out pattern. whereas this yarn’s official title was “crappy alpaca”. it was from a freebie bag joanna gave me to play with that was so full of vm i had to throw most of it away. it was slubby, uneven and so softly spun it barely held together in places. 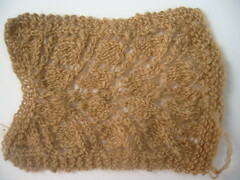 so as a yarn it looked dreadful, but knitted up it’s a dream, soooo soft and light. there isn’t much stitch definition (which is a blessing given the state of my lace knitting), but otherwise it’s perfect. who’d have thought it?